The Mira Prism is a strange product, intended to fill a gap that may or may not actually exist: the mid-tier AR market. The brand new startup is positioning the headset as the Gear VR or Google Daydream of augmented reality. It’s a fair comparison, as far as cost and utility are concerned — the $99 headset doesn’t feature any on-board electronics. It’s more or an optical visor, really. 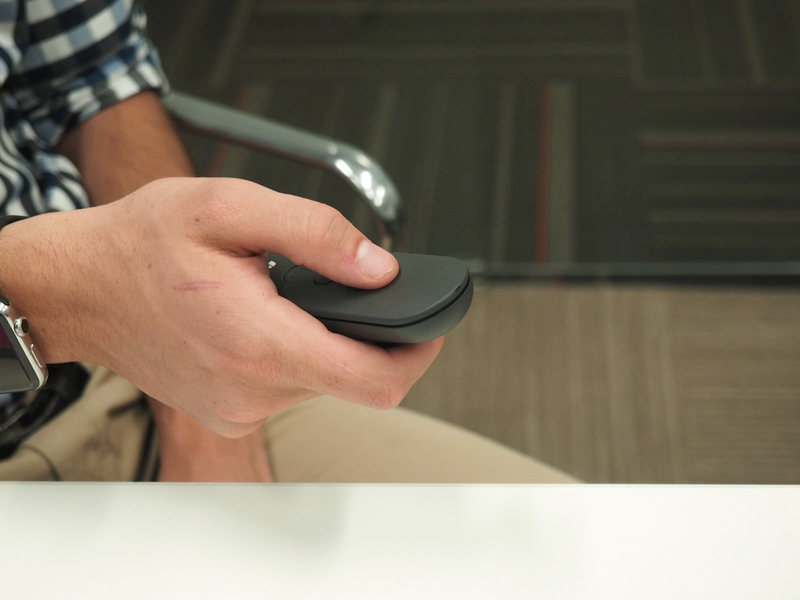 Users slide an iPhone into the headset and see its display reflected into their line of sight, while the phone’s front-facing camera takes care of some limited positional tracking. The headset looks like a more stylized version of those magnifying glass headset jewelers wear when working with small parts — and early iterations were built from 3D printed plastic and repurposed goldfish bowls. The concept was compelling enough to spark the interest of a number of notable investors, ranging from Salesforce CEO Marc Benioff to serial entrepreneur and sometimes music guy, will.i.am. Earlier this year, in fact, the company closed a $1.5 million seed round led by Sequoia, which it’s using to bring the hardware to market and help develop some software that will be available when it launches to consumer before the holidays. It’s easy enough to figure out why investors have jumped on board. Augmented reality has arguably been an even bigger industry buzz term than virtual reality since the stratospheric ascent of Pokemon Go. Meanwhile, companies like Apple have expressed cautious skepticism about VR all while embracing AR with open arms. After all, the technology is much more accessible in terms of every day use — you can enjoy the advantages of AR out in the world without the need for a dedicated headset. The Prism promises a much more accessible price point than most of the AR headsets on the market. During our meeting with the company, co-founders Ben Taft and Matt Stern (the CEO and COO) namecheck Microsoft’s Hololens and the DAQRI Helmet, which carry price tags of $3,000 and $15,000, respectively. Of course, comparing those technologies to the Prism, is like pitting Google Cardboard against one of those IMAX-approved StarVR headsets — it’s just a different beast altogether. While the pricing certainly qualifies the Prism as a consumer device, its actual usefulness depends largely on the sort of content the company and its partners are able to create for it. We got a demo of a Pac-Man and Space Invaders knockoff game with killer donut holes, which the company admitted was not the most compelling piece of software, having been developed in-house. Building up a healthy library of content will be Mira’s biggest challenge, especially given its unique format which ignores the SLAM tech that gives AR its environmental awareness, a risky choice for an emerging platform in the space. It’s still a fairly solid AR experience for $99 — with 360-degree gameplay that’s overlaid on the real world. The Prism also links up with nearby headsets for multiplayer gaming, and Stern placed a small circular tracking marker mat on the table that serves as a maze for the Pac-Man-like game play. But the product still has some hard questions to answer. For starters, can it really provide that much more compelling an experience than AR on a phone — or, for that matter, a similarly priced VR headset? After all, one of AR’s big selling points is the fact that the technology isn’t as isolating or constraining as VR. You can take it out into the world and still have full view of your surroundings. 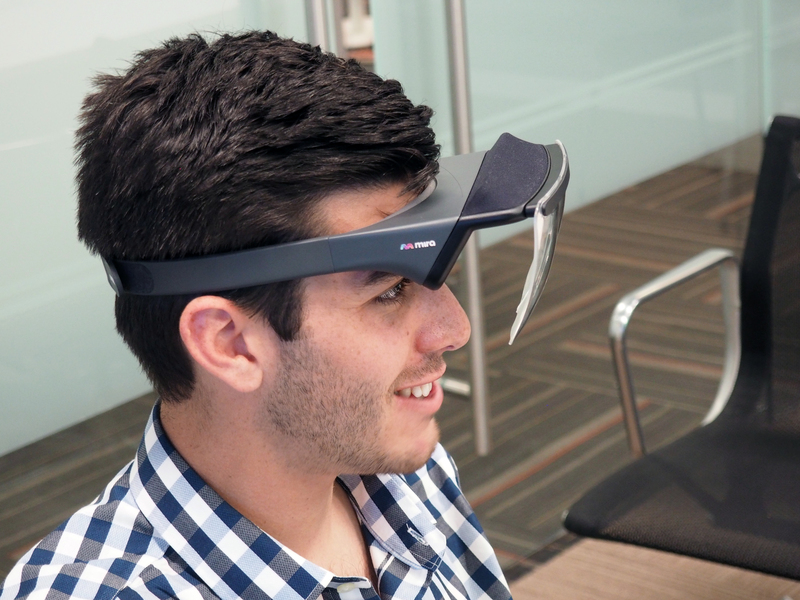 The Prism, on the other hand, is too bulky and awkward to attempt to wear outside, as the company readily admits. “We’re definitely not encouraging people to walk around with it,” Stern said doing our conversation. So, much like a VR headset, you’re going to be stuck inside with the thing. Mira is working toward something smaller and more subtle that wearers can take out into the world, undetected — or at least minimally so, inline with what Snapchat offers with the Spectacles. But that’s probably a couple of generations off — so hopefully investors are in this for the long haul. In the meantime, the company has its work cut out for it creating and helping port AR experiences compelling enough to convince consumers to go inside and pop on a $99 headset.